Spanky and Dally form an unlikely companionship. 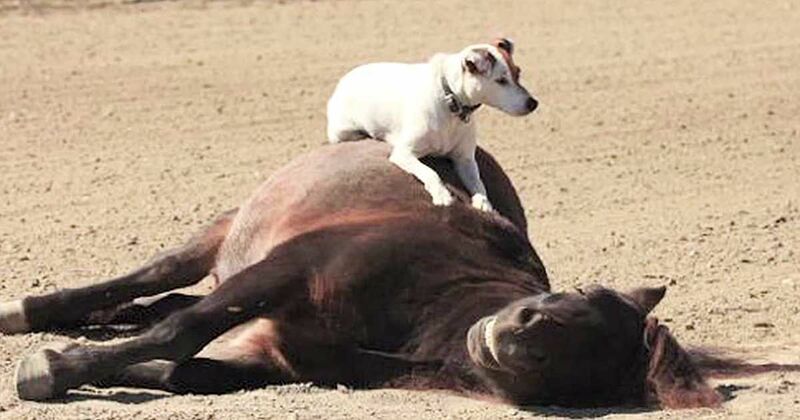 Spanky is a miniature horse and Dally is his 5-year-old Jack Russell Terrier friend. Both of the animals were rescued by horse trainer Francesca Carson, who guided their friendship into something that impresses everyone who sees it. "Dally would always sit and watch while I was training Spanky and then one day she just leaped up onto Spanky’s back – on that day their friendship really started," Carson said in a Telegraph interview. It's quickly evident that this pair is unlike any other horse/dog duo. Dally actually has been trained to ride Spanky, and they perform for crowds of all sizes, including a performance on the Late Show with David Letterman. "The cool thing about minis — people who don’t even know much about riding, they just love to see them,” Carson told The Columbian. "They get really interested because they’re so cute." Watch the video below to see the pair's incredible talents: Dally enhances Spanky's good balance and nature, creating a show worth it to behold. If you were as blown away as we were by this amazing duo, make sure to share it with your friends on Facebook!